Overview:Near Earth Asteroid 4719 Toutatis passes within 1.5 million kilometers of Earth. This entry was posted in 2004, Newspaper Articles on August 31, 2004 by glen_h. Overview:Details on what happened during the 2004 Perseid meteor show public observing session. This entry was posted in 2004, Newspaper Articles on August 13, 2004 by glen_h. 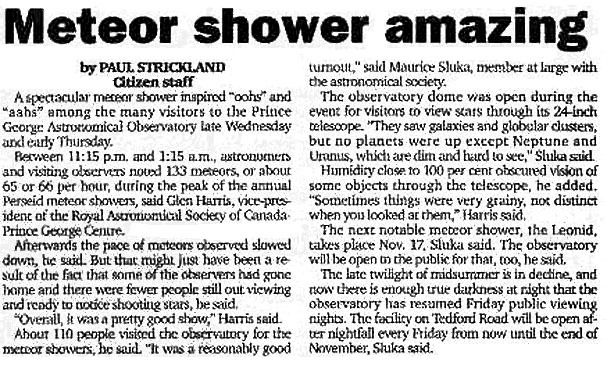 Overview:Announcement of the 2004 Perseid meteor shower public observing session. This entry was posted in 2004, Newspaper Articles on August 6, 2004 by glen_h.